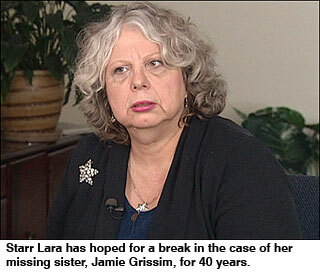 CLARK COUNTY, Wash. – Starr Lara’s sister, Jamie Grissim, left Fort Vancouver High School and vanished with hardly a trace 40 years ago. Starr will mark the tragic milestone Saturday with a candlelight vigil and says she’s trying to come to terms with more bad news she recently received in the murder investigation. Jamie was Starr’s big sister. She left their foster mother’s house, went to Fort Vancouver High School and never came home. That was Dec. 7, 1971. Starr was told Jamie simply ran away. “I just kept staring out the picture window,” Starr said during a recent interview. Six months after she disappeared, Jamie’s identification was found by a neighbor picking up trash on Dole Valley Road in a very remote part of northeast Clark County. Then two years later, another neighbor walking up a nearby logging road discovered the remains of two women. One was identified as Carol Valenzuela. The other woman has never been identified. Clark County detectives have long thought suspected serial killer Warren Forrest is responsible for the deaths of those two women. A sheriff’s office document says they also suspect that “Jamie Grissim is the first victim” of Warren Forrest, but they’ve never been able to match Jamie to the unidentified remains. Starr was excited to learn a detective was trying again to match DNA to Jamie on hair found where the bodies were dumped. When Starr recently got the news the crime lab couldn’t get usable DNA to make a comparison, she urged the detective to re-examine the skeleton itself. Starr says she was told Jamie’s dental records – that were compared years ago to the remains and used to rule Jamie out as a match – were incomplete. Starr hoped new technology would reveal more clues. The Clark County Sheriff’s Office wonders if the remains were sent to the task force investigating the Green River Killer, were given to an anthropologist who used to teach at Clark College, or maybe they were lost when the medical examiner moved its offices. “In my mind, that girl was connected to Jamie. I don’t know if it was her or not. I can’t prove it either way now,” Starr said. Now she has to hope for a break in the case from an unexpected source. 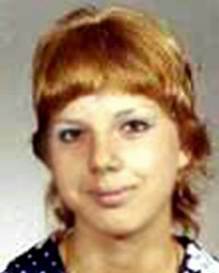 The medical examiner’s office says its last record of the remains was in 1978. They were sent to a nationally renowned forensic anthropologist in Oklahoma. Staff there told KATU News it is checking records to see if they still have the remains. The candlelight vigil for Jamie Grissim will be Saturday at Fort Vancouver High School. It begins at 4:30. The public is encouraged to attend.